Designed and manufactured in house by Genetic Supplements, newly reformulated for an even creamier tasting dessert, Muscle Mousse® is now available in 750g tubs which makes it easier to ‘mix it up’ a little when it comes to your favourite protein dessert collection! Keep a lookout for more exciting flavours coming in 750g tubs soon. Muscle Mousse now contains DigeZyme digestive enzymes & LactoSpore probiotics! Muscle Mousse® dessert is a high protein, gluten free dessert mousse that can be enjoyed at any time of the day. 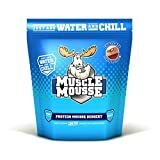 Muscle Mousse® dessert mixes with water in a regular shaker bottle in seconds and sets in minutes to form a real mousse.